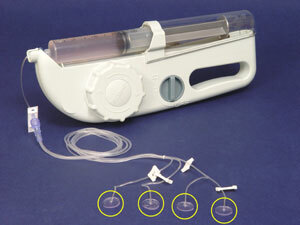 Repro-Med Systems sells the FREEDOM60® Syringe Infusion System as well as other medical devices. The company is profitable and has grown revenues at 29.6% annually since 2006. Repro-Med was co-founded in 1980 by CEO Andrew I. Sealfon, who owns 21% of shares outstanding. Repro-Med’s flagship product is the FREEDOM60® Syringe Infusion System. This device allows patients to receive constant drug infusion therapy without being tied to an IV stand, allowing them to go about their lives. It looks like this. The device can be used to administer several different drugs, and the company continues to search for new applications. FREEDOM60® is approved for use in the US as well as many European and Asian nations. Very importantly, Repro-Med’s product is the only Medicare-approved product for subcutaneous administration of immune globulin. I am not extremely familiar with medical terminology, but a little googling informs me that immune globulin treatment is given to patients with compromised immune systems and autoimmune disorders. Elements of FREEDOM60®’s design are patent-protected. The company also sells the RES-Q-VAC® Suction Unit. In 2012, sales of the FREEDOM60® accounted for 86.4% of Repro-Med’s total revenue, while RES-Q-VAC® accounted for 12.3%. Other legacy products made up the other 1.3% of sales. The success of the FREEDOM60® has resulted in record revenues and operating income for the company over the last twelve months. In the quarter ended August 31,2012, revenues rose 43.3% over the same quarter a year earlier and operating profit leaped 203%. Net income was artificially inflated in 2008 and 2009 as the company wrote up the value of net operating loss carryforwards that had previously been written off. A better gauge of true profitability is operating income, which reached a new high last quarter. Repro-Med’s balance sheet is extremely healthy, showing $1.94 million in cash and equivalents against total liabilities of just $1.22 million. The company also makes extremely good use of its assets, recording a return on equity of 32.9% in 2011 with minimal leverage. Despite its track record of nearly 30% annual growth, positive free cash flow and robust profit margins, Repro-Med’s valuation is modest. On a twelve trailing months basis, Repro-Med has a P/E ratio of 9.00 and an Enterprise Value/EBITDA ratio of 4.35. Since, Repro-Med is growing so quickly, twelve trailing months data understates the company’s earnings power. Annualizing results from the quarter ended August 31, 2012 gives a P/E and EV/EBITDA of only 6.03 and 2.98, respectively. Regardless of how it is calculated, numbers like these are more typically seen in low-growth or highly cyclical companies, and Repro-Med is neither. Of course, the fact remains that Repro-Med is a tiny company competing in an industry dominated by gigantic international companies with deep pockets and huge R&D budgets. It’s possible that new drug therapy regimes could render Repro-Med’s products obsolete or changes to Medicare could reduce reimbursements for the FREEDOM60®. Despite these risks, the company has been extremely successful in increasing revenues and profits. As Western societies (and eventually the rest of the world) grow older and require more frequent and more intensive medical care, medical device manufacturers like Repro-Med stand to benefit from ever-increasing demand. How long are patent(s) protecting FREEDOM valid for? How did you determine that that is the key patent? What about this one: http://www.google.com/patents/US6926706 ? I don’t know the answer but wish to understand. “On June 10, 2003, we received patent #6,575,946 for our new Full Stop Protection(R). This addition to the RES-Q-VAC(R) system prevents any fluids from exiting the system. It also serves to trap airborne and fluid pathogens. We believe that the addition of the flow block design substantially separates the RES-Q-VAC(R) from competitive units, which tend to leak fluid when becoming full or could pass airborne pathogens during use. There is a heightened concern from health care professionals concerning exposure to disease, and the filtered RES-Q-VAC(R) provides improved protection for these users. Looks like they might have other patents, but #5,336,189 is the only one they list that applies to FREEDOM60(R). Thanks – I saw that soon after I posted my comment. I still wonder about the additional patent I noted and how important it is. Assuming they don’t need to design but still need to invest in infrastructure to manufacture the pump. Why bother when this has brand recognition and infrastructure for cheap. Also, the patent seems to protect the syringes they just released to the market (I’m thinking same business model as ISRG) which doesn’t represent much in revenue as of now. Yes – Their business model is like the old Bic Razor. Give them the razor and sell em the blades. For each pump they sell (about $399) they sell a couple hundred dollars a year in supplies, ie. the new safety needle sets. Whoppper investments has recently written up this company. Looks like this one might finally be on the verge of really moving after several quarters of poor results and stock performance. Let’s hope! Might be time to build a new position in this one.